It provides waveform previewing, auditioning, and selection tools. 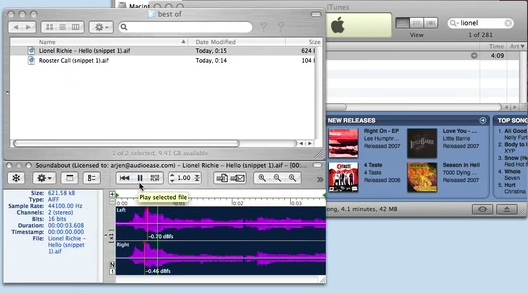 It integrates with Finder, so it’s always available when you navigate sound files. It edits, slices, and dices. It automatically converts files to MP3 for email. It integrates with Pro Tools, automatically aligning to the cursor. It’s unclear whether the integration will extend to other apps, as well; at this point all we know is what you can see in the video. We’ll keep an eye on this one; will be great to see this idea develop into a finished product. It’s not hard to imagine sample addicts using both — AudioFinder now, and Soundabout when it comes out. We’ll be waiting.